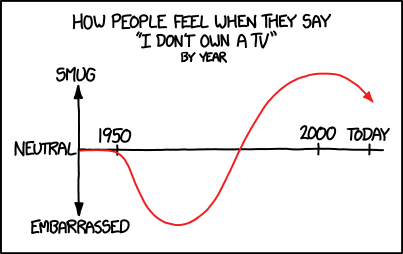 XKCD today ran a comic entitled “I don’t own a TV”. The comic implies that we have passed the peak moment where it is cool to say that you don’t own a TV. I think xkcd may be right, but perhaps not for the reasons you think. When I was a child, my mother worked in kid’s TV. This was great, because it meant she didn’t have a leg to stand on when she tried to argue that kid’s TV was rotting my brain and tried to limit my screen time. It also meant that we had two televisions in the house, when most people only had one. These days, of course, we can get video content wherever we want: on plasma and LCD televisions, on phones, on laptops, on tablets. Everywhere. The consoles wars that have just intensified with the launches of Xbox One and PlayStation 4 are all about that big screen in the living room. 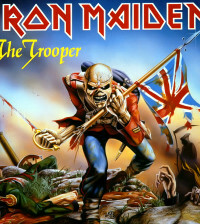 The thinking seems to be that if a console manufacturer can control the device that is connected to the large screen in the shared living room space, it will control our media consumption, and be able to extract economic rent from content makers and advertisers for accessing the audience it controls. I think that strategy is flawed. The vision of the living room being the place where entertainment is accessed is flawed. That is not the future of screen-based entertainment. The large screen in the living room matters. It is where the family will gather to watch the X-Factor final or the Olympics. It is where sports fans will gather to watch the big game and where mates will play FIFA after a night out in the pub (although I understand this may be a peculiarly British phenomenon). But the large screen will not be our conduit for entertainment. That conduit will be a personal screen. Each and every one of us will own (or, in the case of children, share with their parents) a personal device, probably a tablet or a smartphone. We will consume our screen-based entertainment on that device. And we will negotiate with other household members when it is appropriate for our stream of content to be on the shared device, and when our stream of content will need to be viewed on our personal screen. So, to stereotype wildly, a small child might ask his parents to stream CBeebies onto the big screen. 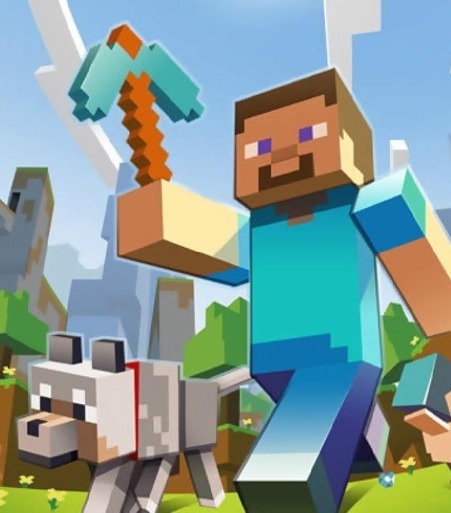 After a while, the tween daughter asks if she can stream Minecraft for a while. In the afternoon, Dad demands the screen to watch football and by early evening, Mum kicks every other stream off so she can enjoy Strictly Come Dancing (Dancing with the Stars for anyone non-British) on a 42” screen. Anyone can watch anything, whenever they want. The only debate is whether they get to use the big screen or not. Touch screen navigation beats every EPG (Electronic Programme Guide) ever invented. Each family member has his or her own media library, to be consumed when they want to. To my mind, this is what I mean when I say (and when others say) that the television is already the second screen. It is the large, shared, amazing experience that dominates our living room entertainment. But it is not the future. The future is personal. Portable. Touchscreen. With the ability to throw stuff up onto the single big screen that each household will have when that makes sense for the content (or can be negotiated with other members of the household) and to view on the personal device at other times. The TV is dead. Long live screen-based entertainment.